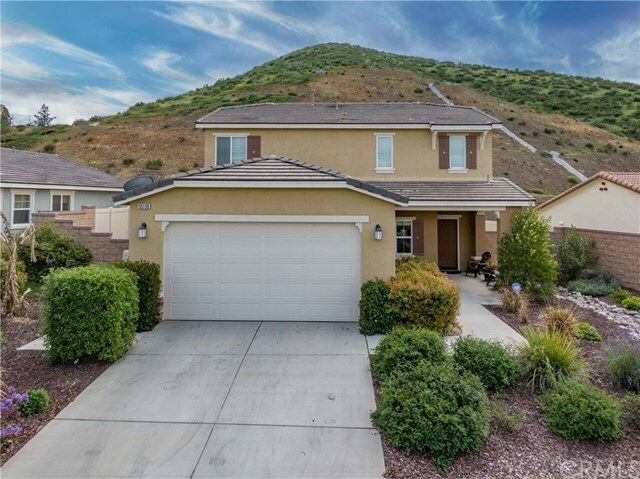 BEAUTIFUL MOVE-IN READY home with PAID OFF SOLAR located on a cul de sac in the highly desirable community of Canyon Hills! Home has an open floorplan. The kitchen has stainless steel appliances, granite counters, walk-in pantry, kitchen island with pendant lighting and lots of cabinets for storage opens up to the family room and eat-in kitchen area. Downstairs has a bedroom, bathroom and laundry room. Custom wood moldings on windows throughout. Upstairs has a master suite with large walk-in closet, dual sinks in bathroom and a sliding barn door for additional privacy. There are two additional bedrooms and full bathroom with linen closet upstairs. The private backyard with no rear neighbors has an Alumawood patio cover, upgraded lighting and ceiling fans with a circular sidewalk for your kids to ride their toys! Walking distance to elementary school. Association offers community pool/spa, splash pad and parks. Don't miss this one!